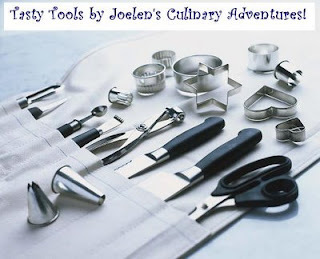 November Tasty Tools: Round Up! So have you had enough holiday fare with Thanksgiving over? By chance did you get a glimpse of our Tasty Tool this month in a kitchen? 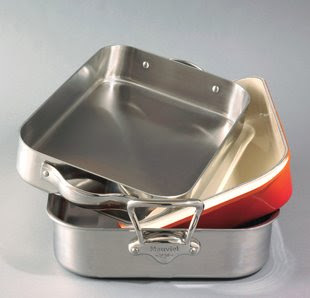 That right, this month we highlighted Roasting & Braising pans. Fellow bloggers have submitted recipes using their roasting/braising pans and it wasn't all filled with turkey! Check out the wonderful recipes submitted and next time you think of a roasting/braising pan, hopefully other recipes come to mind aside from turkey! Thanks to fellow bloggers for participating this month! Everyone should try making a roasted chicken once. It's a classic dish that is easier to prepare than some folks think! Cathy shares with us her roasted chicken recipe and a tip she got from Paula Deen to get a nice crispy skin from baking. Wanna know what that tip is? Check out Cathy's blog for the recipe and more! 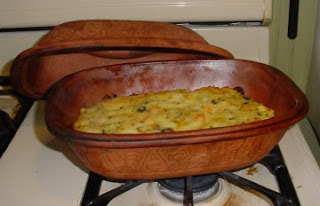 Cate's recipe is a versatile one in that it can be made in a Dutch oven and braising pan! This dish is rich and full of flavor... especially with 2 kinds of wine, fresh herbs and bacon in the recipe. Perfect for the cold winter months, you'll want to sneak a peek at Cate's blog and check out the recipe! I love how very cool Rachel's roasting pan is. It's not the fancy shmancy stainless steel I'm familiar with, but rather a Roemertopf clay pot roaster. Where can I pick up one of those?! Rachel tackles leftover mashed potatoes and steps them up in this gourmet remix. Check out Rachel's blog for the recipe! Everything is better with bacon! 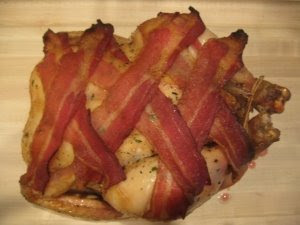 Amy shares with us her beautiful roasted chicken adorned with crisp bacon. 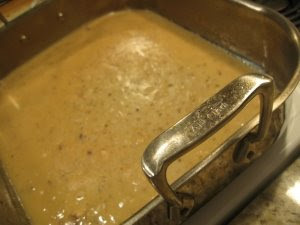 To accompany this dish, she made a gravy right in her roasting pan using drippings from the chicken. Yum! Check out Amy's blog for the recipe! I saved Karen's dessert for last because shes proves that a roasting pan is quite a useful vessel even for desserts! 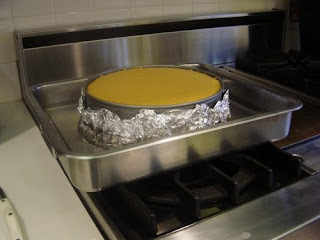 Using her roasting pan, she created a bain marie - an ideal technique in making cheesecakes. 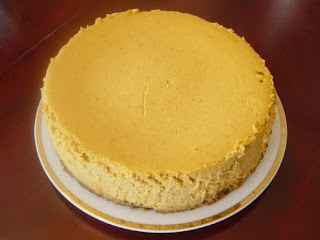 Check out Karen's blog... and make a cheesecake for the upcoming holidays! Cheesecake in a roasting pan, excellent idea! Hey, I got my fancy schmancy clay pot cooker at a yard sale and I see them from time to time at other yard sales and thrift shops, so people may want to check this cheap route to acquiring one. I don't use this cool and tasty tool often enough. It's pretty hard to overcook or burn something in one. They crisp things up so beautifully.